The most obvious difference is of course a lack of a pump in a lymphatic system. The blood throughout our body is pumped by the heart-the most powerful muscle in the human body. However, the lymphatic system does not have any such system. It flows through the veins in a passive manner. The liquids are pushed along the system by the normal movements of the body. Another very important difference between the two relate to their functions. Blood flows through our veins and carries oxygen to all parts of the body. The lymphatic system in fact removes the waste and other products that are released in the tissues. The blood in our body flows in a continuous cycle. It is in the form of a cycle. The oxygen deprived blood is carried to the heart and replenished with oxygen. After this, the same blood is channeled throughout the body. However, the lymph flows in a different manner. 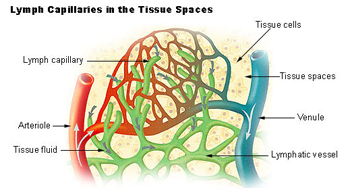 It flows from the tissue into the lymphatic system. However, once it gets into the vessels, the lymph can only flow in one direction. The constituents of blood are different from those of lymph. Blood consists of liquid plasma, white blood cells, red blood cells and platelets. The filtered lymph that is channeled into the cardiovascular system is more like a milky white or clear liquid. Any injury on the surface of the body causes the spurting of blood. So it is something that you can see. However, it is very difficult to observe damage to the lymphatic system unless you are confronted by swollen lymph nodes. The blood is purified in the kidney. In the kidneys, the waste products are absorbed and excess liquids are removed. Once this is done, the essential liquids are returned to the cardiovascular system. However, the lymph system is self sufficient. The lymph nodes located throughout the body remove the waste and kill some of the pathogens. 1. Blood is pumped throughout the body by the heart, but the lymph is moved along through the normal function of the body. 2. Blood transports oxygen throughout the body. Lymph removes waste from the system. 3. Blood flows through the body in a circular motion. The movement of lymph is in a single direction. 4. Blood contains red blood cells, white blood cells and platelets. Lymph is a whitish and clear liquid. 5. You can see blood if there is damage to the vessels. Lymph cannot be seen with the naked eyes. 6. The kidneys purify the blood. However, lymph is purified in the nodes itself. Purpa Mukherjee. "Difference Between Lymph and Blood." DifferenceBetween.net. November 15, 2009 < http://www.differencebetween.net/science/health/difference-between-lymph-and-blood/ >. Incorrect unless you’re using “veins” as an overall term for blood vessels. It’s the blood in the ARTERIES that carries oxygen to all parts of the body (except the pulmonary artery, which delivers deoxygenated blood to the lungs). Blood flowing through the VEINS is en route to the heart after being deoxygenated (except the pulmonary vein, which returns oxygenated blood from the lungs). Thanks for the information. But a part has proved out to be a bit unsatisfactory. It is said that blood flows through the veins but it is absolutely a wrong logic unless it refers to the blood vessels and not just the veins. Because oxygenated blood flows through the arteries except for in the case of pulmonary artery.